ELBERTA LIBRARY—During initial public comment, Scott Gest said the community mapping is wrapping up for the Grand Vision. There was to be a meeting the following week. A report by Ken Bonney, new zoning administrator, was added to the agenda. The updated zoning ordinance was still not up on the Village website. There was some suggestion of having it retyped from hard copies people had, adding additions and corrections, and/or possibly getting a copy from the attorney as a Word document. Emily said she had converted the ordinance to a Word document and sent it to Sharyn in late September, so it was not necessary for anyone to retype it, just make the additions. She subsequently (March 5) sent the zoning ordinance as a Word document to Planning Commission secretary Kelli Stapleton via email. At post time, the updated zoning ordinance was still not available on the Village website, though it can be obtained from the Village office. The commission discussed the definition of “apartment.” One proposed definition: “A unit with 1 or more rooms, with private bath and kitchen facility.” If there are two units, it would be a duplex. Linda Manville wanted to clarify that the kitchen facility needed to be private to that apartment, not a kitchen shared with other units. The zoning ordinance currently addresses housing only for one or two families (duplexes), so the definition needed to specify three or more. They came up with the following, preliminarily: “A unit with one or more rooms, having a private bath and a private kitchen. An independent self-contained unit containing three or more said units.” The final wording on “apartment” was not available at post time. 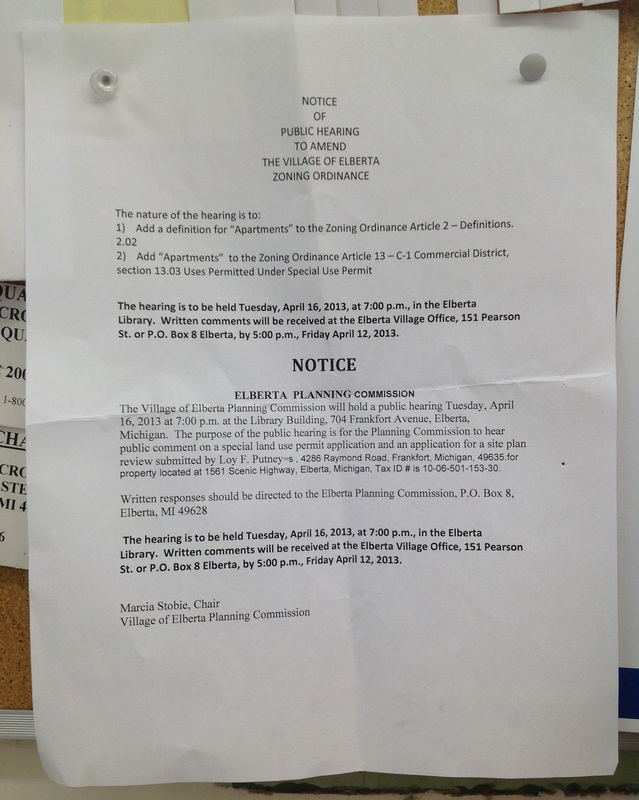 Marcia Stobie told the Alert it would be made available to the public a week before the hearing, which is on April 16 at 7 pm in the Elberta Library. The commission voted to make “apartments” a special use. The commission discussed noticing for the hearing on the definitions and Loy Putney’s special use permit. They tabled updating their bylaws, as some members had only just received a copy. The terms of some members were found to be expired. Someone was going to talk to Sharyn about getting a list of whose terms are up. If someone wants to join the commission they have to talk to Sharyn. Marcia discussed hiring Kurt Schindler of MSU Extension to review the zoning ordinance, at a fee of not more than $1,500. Schindler needs to know whom to contact within the commission; he will look at the zoning ordinance and the recently adopted master plan. He would then meet with the Village Council and Planning Commission members and give them direction. The commission voted to have Schindler look at the ordinance with a fee cap of $1,500. The commission approved a budget for 2013–14; Marcia had already submitted a budget at the February council meeting. They discussed the zoning map, which needs to be updated. The commission may engage the Northwest Michigan Council of Governments to update the zoning map, since they have the old map files. Cost would be approximately $70/hr. A letter from Attorney Ed Roy suggested the commission was not yet ready for a hearing on Loy Putney’s special use permit. Ken Bonney will continue to review the application and will probably have his response ready by April. He will submit his response to the Planning Commission and then PC will indicate their decision and present it to council. Russ Mix said the Commission intends to work with Putney, not stop him. Linda Manville mentioned a conference coming up on April 22 on “Small Town and Rural Development” at Crystal Mountain. On May 10 the Lakes to Land Initiative is holding a Conference of Communities, for each community to present their top priorities. Linda would be attending the May 10 event. It was unclear whether anyone would attend the April 22 event. Linda said we don’t fit in the framework yet for Lakes to Land because we already have our master plan. During final public comment Emily Votruba mentioned the International Property Maintenance Code that had just been adopted by the County Commissioners. All but Don Tanner had voted for it. “Apparently it is very controversial and appears to be regressive in regard to energy, conservation, and building size. Also it disallows too many things and states grass height must be no more than six inches.” Marcia said, “I think that’s fine,” referring to the grass height. The code was later rescinded, at the March 26 commissioners’ meeting. Emily asked if it had any bearing on the proposed dredging. Scott said the project wouldn’t be doing any hydrological studies related to dredging. Marcia asked if anyone had contacted the Village of Elberta regarding the money allocated for dredging. Emily said she’d sent an email to Josh Mills asking whether any of the money would be used in Elberta’s municipal Marina Park or elsewhere on the Elberta side and whether any Elberta officials had met with him. Josh responded on March 8 with the following (note that the funds had not been finally approved at the time of writing; Governor Snyder signed the harbor dredging bill on March 27 and Frankfort did receive the $2.24 million). The City may receive up to $2.24 million from the State of Michigan to be utilized for dredging expenses. The City will be administering the grant. It is hopeful that the State of Michigan will allow the City of Frankfort to negotiate a Design Build contract with a reputable dredging firm. I know of such a firm nearby. This form of procurement will allow the efficiencies of the funding to be extended. Goals associated with the dredging funds will first be utilized to cover expense associated with dredging the channel encompassing and leading to the [Frankfort] Municipal Marina and launch ramp. It is hoped that the State of Michigan will allow the City to extend those dollars to include dredging the channel east of the launch ramp to East Shore Marina. Also, it is the desire to dredge the channel leading to Betsie Bay Marina and North Star Marina. If funding is remaining and the State of Michigan will allow; it is a goal to utilize the remainder of funds to ensure the the Betsie River/Lake Betsie Fishery is preserved ensuring all fish species are able to traverse between spawning grounds in the Betsie River with Lake Michigan. Phragmite eradication of some level is also a goal to tackle, if any level of funding is remaining. The Corps of Engineers may also want some level of dredging to occur in the outer channel near the pier heads, although that area is not critical at this time. I submitted a very detail needs assessment to the State of Michigan in December that included every area mentioned above. As far as Elberta officials; I talked to Ross [Thorsen], Kris Mills and a representative of North Star Marina last week [J. Keith Harness, who confirmed this with the Alert by phone]. I have spoke to Reggie on a few different occasions regarding my intent to procure funding. I am optimistic that we will be able to ensure safe passage to all marinas currently operating as well as take care of some of issues associated with the shoaling and siltation at the river mouth. The river mouth issue and the proper work activities and protections associated with the preservation of this critical ecosystem will likely be an issue that will require further collaboration and procurement of funding to minimize any long term negative impact. I have been engaged in extensive lobbying with the Waterways Commission to extend the efficiencies with the funding to include all areas mentioned above. I am hopeful that we will be able to achieve all or most needs of the harbor ensuring that we will not have any navigational issues.